One day a lady on my Facebook feed asked what were the best shoes for social dancing. 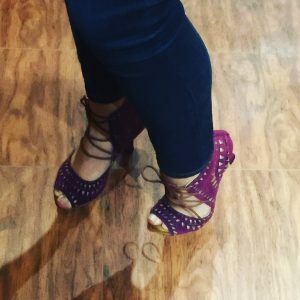 A few of the comments mentioned Yami Dance Shoes as the most comfortable and so I decided to buy a pair and give them a try. To me, anything besides a jazz or ballet flat or sneaker does not feel particularly good to wear for more than two or three hours at a time. 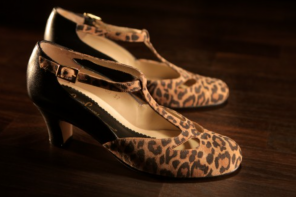 I tend to tap out after a few hours of dancing in heels or just skip wearing them altogether. Blisters on the tops of my toes and aching feet just don’t justify looking cute for me anymore. So I felt skeptical that Yami Shoes would live up to their promise. They’re made with extra cushioning on the heel and under the ball of the foot, as well as an additional padded insole. That all sounded good but would it really feel that much better? 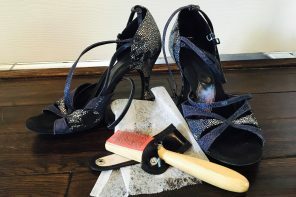 Different styles come in different heel heights and the website says you can have any style fitted with the heel of your choice if you allow three to five weeks for production of a more custom shoe. I knew I didn’t want anything higher than three inches and opted to get the Micaela in plum with a three-inch flare heel. Usually I’m between a 6 and 7.5 (US) in street shoes and between 5.5 and 6.5 in dance shoes so I got a 5.5 in the Micaela and they fit just right. I purchased the pair in December 2017 and despite my skepticism they did turn into my favorite pair of dance heels. These purple shoes have accompanied me to countless socials, several classes, a handful of congresses and a performance or two in the last 10 months. Here’s why. Yes, they did take time to break in. The first time I wore them, I was not blown away. After about three hours I was done. They didn’t feel much different from other brands except that they didn’t rub or give me blisters because of the soft fabric lining. The balls of my feet still ached and felt tired though. But after maybe two or three more wears, they started feeling better and now they feel great. Sliding them on feels like slipping into my favorite pair of jeans. The lace up design and triangle cut outs stand out but I think the shoes really start conversations because of their beautiful purple coloring. The shade is deeper than pictured on the website but I like it better. I thought I wouldn’t be able to match the shoes with many outfits but the pairings actually work most of the time. And if they don’t, I figure it’s dark enough on the social dance floor that no one will notice or care. For me, they’re comfy but still not a magic bullet. After five or six hours of dancing, my whole body, including my feet, start to feel the effects of all that movement. But I do feel like I can wear my Yamis for that whole time and not change into flats halfway through the night. I’m not limping off the dance floor at the end of the night and that feels like a win to me.